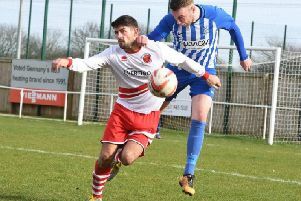 Action from Skegness Town against Skegness United. A goal in each half helped Skegness Town come back from behind to win Valentine’s Day seaside derby at Wainfleet Road. Both sides went into the match playing their first Lincolnshire League game for three weeks. United were looking for their first win of the year and Town wanted to maintain the pace at the top of the table with Horncastle and Wyberton. United grabbed the early initiative with a Kurt Crossley goal, but the Lilywhites bounced back to equalise before the break, sealing the points in the second half. Crossley’s opener, scored on his 100th appearance for the club, had a touch of good fortune about it, direct from a free kick which deceived everyone in the box. But the visitors levelled after 32 minutes when skipper Ben Davison rose to head home McCauley Parker’s inswinging corner. On a poor playing surface both sides looked most dangerous at setplays, but Town finished the first half the stronger. Makeshift centre forward Michael Hardy headed over from close range and McCauley Parker was inches away from connecting with a header when a cross was whipped in from the left. The second half was less than a minute old when the Lilywhites grabbed what proved to be the winner. From another corner, this time from Liam Papworth, Davison was on hand to head home. However, United’s Clark may have had the final touch for an own goal depending on which side of the fence you sit. It was a body blow for the home side, who were looking for their first points of 2015. Indeed, they struggled to recover and conceded most of the possession for the next 30 minutes. During this period of dominance the Lilywhites failed to add to their tally, with McCauley Parker squandering at least two gilt-edged chances in front of goal. Corners continued to provide the visitors with their best opportunities, but the United goalkeeper was rarely stretched. Chances came and went and the champions were almost made to pay for their lack of finishing when former Lilywhite Michael Howard set up another ex-Town player Arron Scutt in the 84th minute, but Scutt’s shot from 12 yards struck the outside of a post. So Town secured the local bragging rights. The 140-or-so spectators who witnessed this latest derby clash will not have been impressed by the quality of football, but much of the blame for that must lie with the conditions underfoot. Although a great leveller, they hampered both sides in their efforts to play any passing football. Skegness United: Elliott Clark, Rhys Mansell, Luke Durdey, Alex Tittcombe, Sam Sleight, Andy Reeson, Arron Scutt, Michael Howard, Luke Rayner-Mistry, James Steed, Kurt Crossley, Marcus Leatherland, Mark Hallam, Matt Charles and Corey Cunliffe. Skegness Town: Andy Hewitt, Ashley Murrell, Jame Epton, Liam Parker, Miles Chamberlain, Andy Parish, Michael Hardy, Ben Davison, Liam Papworth, Keiron Elliott, McCauley Parker, Daniel Reid, Josh Bartlett, Ben Drysdale. On Saturday third-placed Town are at home to Nettleham (kick-off 2pm). Meanwhile, sixth-placed Skegness United travel to Market Rasen Town hoping to end their run of five straight defeats.